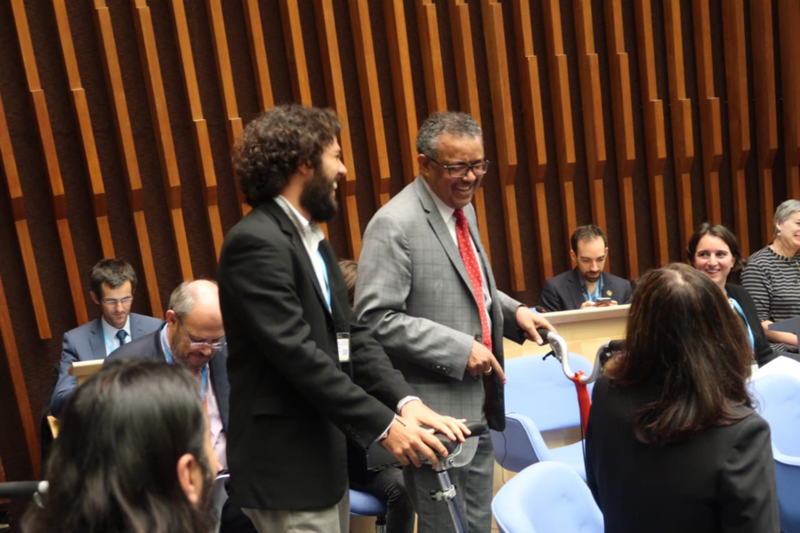 Photo: Mara Lucia, PAHO/OPAS - Dr. Tedros Adhanom Ghebreyesus, Director General at WHO, and Sao Paulo Brazil Bicycle Mayor JP Amaral entering the end session on a bicycle, as an important measure to tackle the global crisis of life-threatening air pollution. At the first World Health organization (WHO) Global Conference on Air Pollution and Health in Geneva, the Breathe Life campaign around clean air for a healthy future got strong commitments from global leaders, governments, IGO’s and NGO’s to change the way we live and work as we do now. “600.000 children around the world die every year, because of air pollution, mostly in developing countries. In London, a 9-year old girl called Ella, lost her life because of asthma. It’s time for change. No more air pollution,” Christiana Figueres said during the opening session. Dr. Tedros Adhanom Ghebreyesus, Director General at WHO, and Sao Paulo Brazil Bicycle Mayor JP Amaral opened the end ceremony riding in on a bike, to underline the importance of the shift from car-centric cities to human-centric. Bicycled Mayors and leaders are representing the more radical changes needed for us to not only survive, but thrive in a future of climate and pollution instability. This leadership network is a decentralized, yet cohesive group of 21st century catalysts, dedicated to rapidly shifting our urban mobility priorities from car-centric to human-centric, thereby setting the stage for a wider-range of changes that benefit all city dwellers. Every percentage shift from a car trip to a bicycle trip results in an exponential improvement in all facets of citizens' quality of life. To this end, a new group of leaders and changemakers must trigger and accelerate this shift, as current leaders lack the sense of urgency, and political will. Amsterdam based social enterprise BYCS initiated the Bicycle Mayor Network in 2016. What started then, with one Bicycle Mayor in Amsterdam, has now grown out to a full-fledged network of passionate changemakers with Bicycle Mayors accelerating city progress on every continent.